I hope you don’t mind me asking you to take action again. But the Prime Minister and Chancellor are, right now, considering whether to release Green Belt land for housing as a measure to be included in the upcoming Autumn Budget. We know that releasing Green Belt land will not solve the housing crisis; will lead to unnecessary loss of countryside; and will add a minimum of 1 million new car journeys every week into London’s Green Belt. Please take a few minutes to email your MP: we’ve made it quick and simple! It is a false belief that releasing Green Belt land will tackle the housing crisis, as the crisis is one of affordability, not simply land availability. CPRE research showed that since 2009 only 16% of houses built on Green Belt outside of local plans were classed as affordable, and nearly three-quarters of the housing proposed on land to be released from the Green Belt will be un-affordable for most people living in the local area. 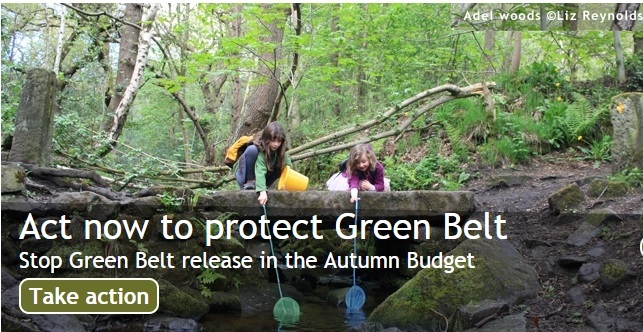 Yet more Green Belt is being released, with 425,000 houses planned as of July – the biggest year-on-year increase in building proposed on the Green Belt for two decades. • Much firmer action on developers who are failing to build what communities need. The use of viability assessments by developers to undercut their affordable housing requirements must be stopped. • Incentives and enforcement on slow build out rates. To ensure developers’ existing commitments are met before further land is released. • The untapped possibilities of brownfield sites could be invested in. Suitable Brownfield land has the potential to deliver over a million homes and brownfield sites are proven to be developed on average six months faster than other sites. Why not build there first?